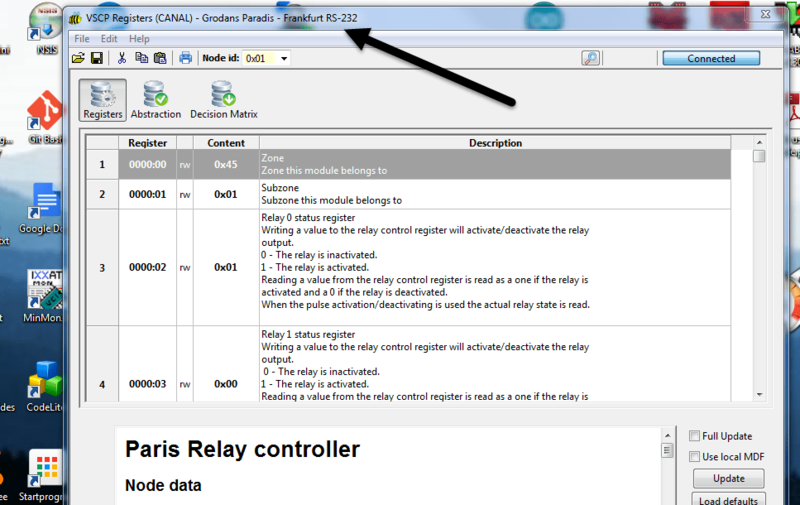 Now the Frankfurt RS-232 module fully works in two of its three modes. The slcan mode still remains and so does the Linux driver for the can4vscp serial protocol . This is now next on the agenda together with documentation and all that stuff. If all goes well things will be fully in place late next week so we can start to produce it the week after. The can4vscp serial driver is a general VSCP serial driver that can be used to couple all sorts of devices to a VSCP system over a serial link. We will supply some reference designs for Arduino and some more. As said above Frankfurt have three protocols built in. 1.) A verbose protocol that can be used as a command line protocol to diagnose and find/configure VSCP nodes on a bus. 2.) A can4vscp serial protocol that is a very efficient and secure serial protocol. 3.) Slcan to be able to connect the unit to socketcan on Linux. The module will be delivered with a usb to serial adapter but can also work over just RS-232. We will also supply a 3.3V TTL version than can connect directly to the Raspberry Pi serial port, or the Beagalbone serial port or the Carambola serial port making it easy to add can4vwscp capabilities to those devices. The price will be good and low.